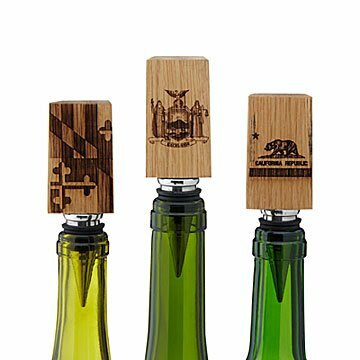 Drew Storm Graham's unique stoppers bear official state flags, etched onto reclaimed wine barrel staves. The age of heraldry may be lost to the mists of time, but its spirit can linger in your bottles of wine. Drew Storm Graham's state flag stoppers bring the symbols, seals, and inscriptions of your favorite state flags to your table. He cuts and sands reclaimed wine barrel staves, adds the hardware, and laser-etches official flag graphics, in miniature form, onto each one. Bound to stimulate lively vexillology* discussions ("What's that guy chopping?" "Where's that steamboat going?") over glasses of your favorite local vintages. Handmade in Denver, Colorado. Drew Storm Graham is a military brat who spent the majority of his youth living abroad and traveling with his family. Thanks to his peripatetic upbringing, he enjoys globally diverse culture and arts. The resulting fusion of different styles and techniques are apparent in his work. Bothered by the accumulation of scrap material from his woodworking projects, Drew decided to use reclaimed materials as the primary element of his products. He now spends most of his time finding interesting ways to repurpose materials and use them in everyday items. Drew attended Stetson University in Deland, Florida, where he received his Bachelor’s degree in Fine Art and was granted an Award of Excellence. He currently resides in the Washington DC area and is represented by galleries nationwide.